There are a few aching bodies in the SGM office today! 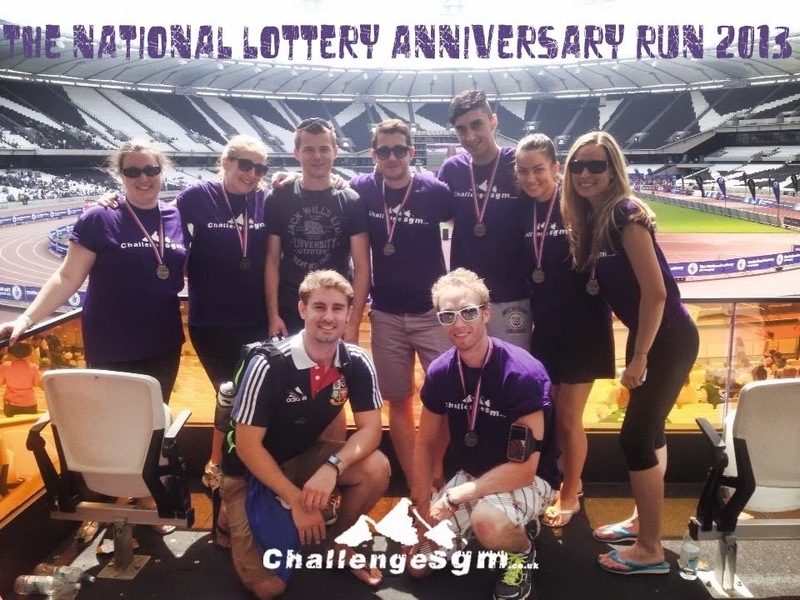 Yesterday was the National Lottery Anniversary Run in the Olympic Park and stadium. There were 7 of us giants taking part alongside friends and family, and thousands of others. The event was organised by The National Lottery and, our client, Nova International. The National Lottery funds many British olympic and paralympic sports in the UK, enabling over 1,300 athletes to train full-time. The event celebrated the legacy of London 2012 and The National Lottery’s contribution to that. The National Lottery Anniversary Run started at 10am so we were up bright and early to get the train to Stratford International. We were really lucky with the weather because after many days of heatwave it was overcast for most of the morning, which afforded us a little bit of cool weather to complete the run. The race was officially started by Sir Chris Hoy and many people were stopping to take his photo at the start line, some people even stopped to shake his hand or give him a high-five! The 5 mile course took us around the Queen Elizabeth Olympic Park and past sights such as the Copper Box and the Orbit, before entering the stadium to complete the run. The last 300m was run on the track inside the stadium with thousands of people cheering us on. It was a fantastic, and emotional, experience and one we’ll never forget. The fastest runner was Alex Cornwell, who ran a very quick 00:25:40! Our own Mersudin Forbes was the quickest of the Sleeping Giant team, completing the 5 mile course in 00:34:38. Well done Mersudin! Everyone did brilliantly and had a fantastic day. To see more pictures take a look at our Google+ page.